Cats aren't usually as noisy as dogs, but that doesn't mean they don't vocalize. Cats will meow, scream, yowl, cry, and make other noises. Sometimes these noises are during the day in response to various stimuli, but many times they are at night when you are trying to sleep. Why Won't Your Cat Sleep at Night? Cats are nocturnal animals so they are naturally awake at night while you try to sleep. They might want to play, explore, eat, scratch, or get your attention and sometimes these actions are quite noisy and we wake up. Some cats are also especially lazy during the day. These cats will have a lot of energy to burn at night since they didn't expend much of it at all while you were awake. If your cat is active, curious, and loves to play, then they may be waking you up at night with their meows seeking your attention. Cats will do many things to get attention, including scratching at your bedroom door, pawing at you, bumping into you, flopping down on the floor in front of you and, of course, meowing. If your cat is crying for your attention while you're trying to sleep, the best thing you can do in the moment is to try to ignore them. This is of course hard for some people, but if you give your cat attention while they are meowing for it, you will only be reinforcing the unwanted behavior. 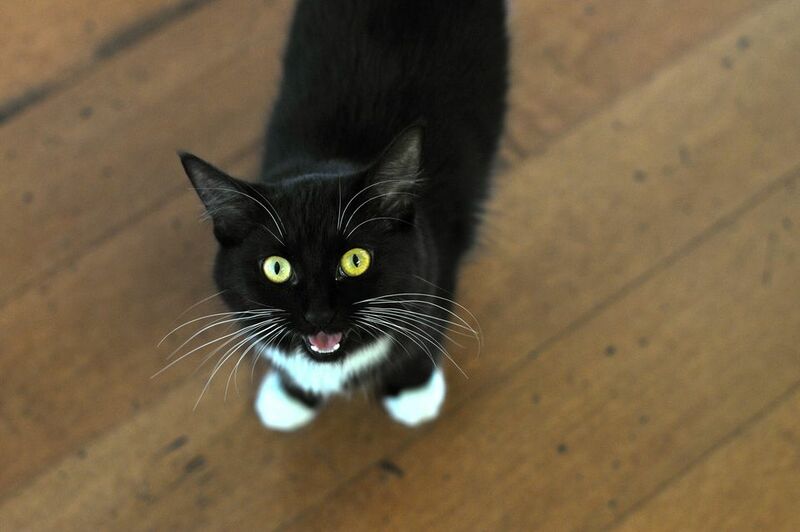 Even if you give your cat negative attention by yelling at it, you are still giving it attention. Earplugs may be your only solution until you can try to prevent the nightly meowing. The next day, make sure you are wearing your cat out during the day by giving it toys to play with. Puzzle toys, feather wands, laser pointers, and battery powered chase toys are great solutions. There are even laser pointers on some pet cameras that can be controlled by you when you are away at work, so you can play with your cat even when you aren't home. By exhausting your cat during the day it will be less likely to want to meow for your attention at night. Did you forget to feed your cat? Cats often cry for food or treats and a hungry cat at night is not a quiet cat. You won't get much sleep if your cat is hungry, so make sure you feed it before going to bed. Do not get up in response to its cries at night, as this will only teach your cat that you will feed it when it meows at you. If you have a difficult work schedule or are concerned about forgetting to feed your cat, consider an automatic cat feeder that controls the meal time and amount of food your cat will get. This will guarantee a regular feeding schedule and your cat is less likely to associate you with getting fed. Similar to people with Alzheimer's disease or sundowner's syndrome, cats can develop cognitive dysfunction that affects their ability to understand what's going on around them. It is not fully understood in cats, but we do know that elderly cats who meow for no apparent reason are often staring at nothing in particular, seem confused, and it often happens at night. If you suspect your cat has some sort of cognitive dysfunction, discuss some options with your veterinarian. Special foods and nutritional supplements may be recommended to help keep your cat's brain functioning as best as it can. If a cat cannot see or hear, they may be scared or confused. At night your house is usually darker and quieter than it is during the day, and if your cat's eye sight is failing or they are deaf and can't see you, they may meow. This meowing could be because they are looking for you or are scared. Your cat may also not be aware that they are meowing because they cannot hear themselves. Eye sight can deteriorate with age and disease, as can hearing, so if your previously well-sighted and hearing-capable cat seems to be losing its senses, get it checked out by your veterinarian. Post-Surgical Lumps in Cats: What's Normal?